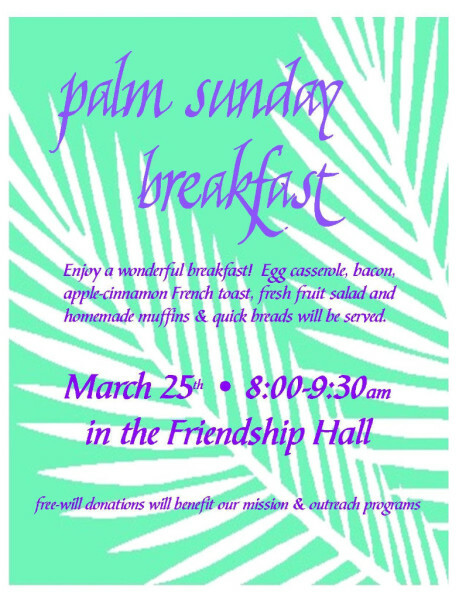 Come enjoy a delicious breakfast prepared by the Members of the Board of Mission and Outreach. Egg casserole, bacon, cinnamon French toast, fresh fruit salad, homemade muffins & quick breads will be served. A free-will donation will go toward food and supplies for the meals they cook at Loaves & Fishes. Reservations for the breakfast are needed, please! Palm Sunday is the gateway to Holy Week, leading us to a greater appreciation of the victory of Easter as we recount Christ’s triumphal entry into Jerusalem and his passion, death and burial. The Palm Sunday service with the Blessing of the Palms and Reading of the Passion will begin at 10:00. As is our tradition, the Deacons will again be serving a Simple Soup Supper, complete with a selection of breads and cheeses.This is not a reenactment of the Last Supper . . . simply a wonderful, peaceful, quiet meal that we invite you all to share in. 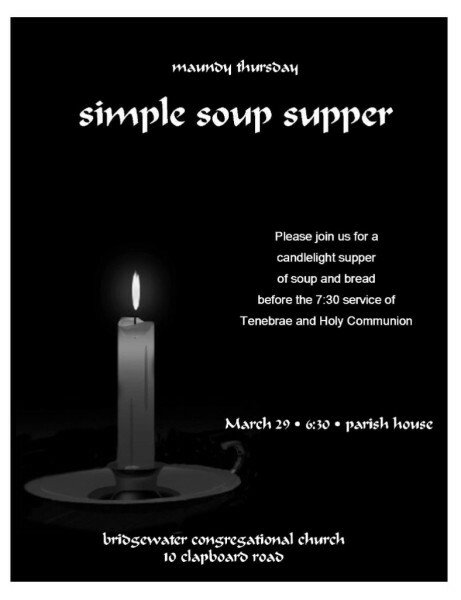 By candlelight, we will share this supper at 6:30 in the Friendship Hall, before the 7:30 service of Tenebrae. Reservations for supper required, please! Maundy Thursday is observed during Holy Week on the Thursday before Easter. The word Maundy (according to one source) comes from "novum mandatum" or "new commandment," and reminds us of the admonishment that we love one another with humility by serving one another and also to remember Christ’s sacrifice. Also referred to as “Holy Thursday" in some Christian denominations, Maundy Thursday is the day that Christ celebrated Passover with His disciples, four days after His triumphal entry into Jerusalem on Palm Sunday. Only hours after the Last Supper, Judas would betray Christ in the Garden of Gethsemane, setting the stage for Christ's Crucifixion on Good Friday. One of our church members wrote, "Some say that this is such a sorrowful time in Christ’s life that they don’t want to go to the service and be reminded of His grief and betrayal. At least, that was what I said for many years. But some time after joining the church choir, I agreed to show up and sing with them during the Maundy Thursday gathering. I was so touched by the service that I would not want to miss it again. Yes, it is sad, and it is very solemn. The lights are dimmed, and the readers sit around a table in the front of the church, reading by candlelight the scriptures’ story of the Last Supper. If you listen with your heart, you can even see the disciples as they might have been that incredible night so long ago. Then, each of us is invited to sit around the table and take communion. It is a very poignant ceremony. Knowing what will unfold on the following day, Good Friday, you may even be moved to tears as I was. It primes our emotions for the miracle of Easter morning." April 1st ~ 6:15 a.m.
some churches! We take the easier route, gathering as darkness fades and the sun rises and celebrating the Risen Christ who brings light to our darkness and life wherever there is death. April 16th ~ 10:00 a.m.
Christ is risen! 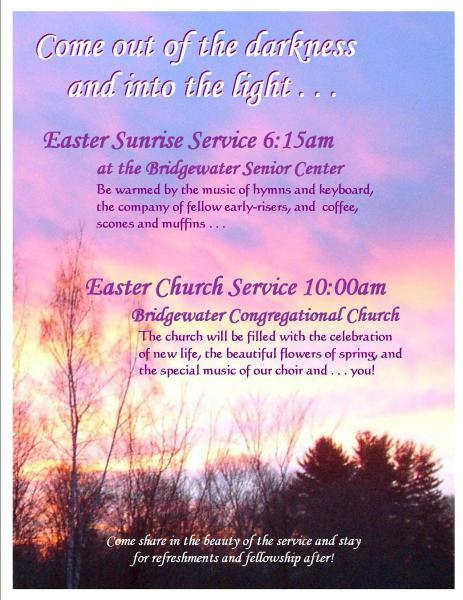 Joyful music for our Easter celebration will be provided by choir under the direction of Maggi Heilweil with accompaniment by Chris Smith on piano and Howard Rovicson organ. Our church will be full of flowers inspiring the hope of spring and new life.